In his 2014 Oscar speech, Matthew McConaughey told us his hero was “himself, in ten years’ time.” Everyone thought he was a narcissistic jackass. Until INTERSTELLAR, when he travels to the future through a wrinkle in time and meets – himself! As Earth dies, astronauts follow three beacons through a wormhole, seeking new habitable worlds, seeking the pioneers who went before them, and, led by the World’s Greatest Surfer Dude, seeking the Ultimate Swell, brah. and a Supercomputer named TARS. McConaughey in a role that – ahem – rockets him to another stratosphere of acting, exemplified in one of the most searing scenes of his career, as he drives away from home for the final time, his face a mask of desolation, tears edging his eyes; his daughter having cursed him for leaving her, his heart lost, his world broken. On top of all that, he forgot his surfboard. A bravura jump cut to the launch of Endurance. We are not cavemen anymore (you know, like people from the 1950s) – we don’t need to see Cooper arriving, suiting up, entering the craft, flicking switches… Nolan’s ingenious filmmaking efficiency shines through in every frame of this epic adventure quest. When we see exteriors of the craft, it is mainly from one truncated angle, sluicing through space or atmosphere; when we see docking maneuvers, we see only the clamps that latch onto the main ship. These funny little props could have been constructed in some corner of a studio set for $13.75 – we never see any other angles, but they convey what needs to be conveyed – either they lock or they don’t, creating the impetus for the next scene. And I love that the spacecraft is called – Endurance! Tough gig, tough name. We have come to accept ridiculously platitudinous spacecraft names (Discovery, Explorer, Endeavor, Challenger, Intrepid, et al), yet none describe what a space journey of this magnitude truly is. Brand (Anne Hathaway, THE DARK KNIGHT RISES), with lips too big for her eyes and eyes too big for her face, and a pageboy hairdo funnier than Wes Bentley’s beard in THE HUNGER GAMES; orating a scientific soliloquy on “love” and how it compels her to follow the beacon that belonged to her lover… Wait, the fate of the Earth depends on this chick’s itchy loins? Luckily, Cooper throws a bucket of water over her. Laughing/weeping inconsolably, Cooper watches 23 years of backlogged messages from his growing kids, as they slowly lose the will to communicate with him. Many critics call Nolan cold-hearted. It may be because he can pull plot stunts like this and then sit back impassively and watch his characters suffer their agonies, but I look at it the other way – if you can watch these characters impassively, you are ice, not Nolan. His powerful human relationships are all the more poignant because we feel every bladed nanometer of their losses. It’s all about relativity. (Yup, that’s why McConaughey meets his relative – himself.) 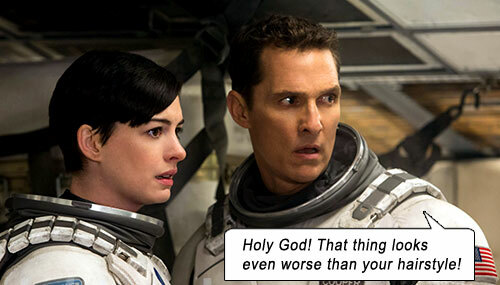 INTERSTELLAR is where Einstein’s relativity, Sagan’s terraforming and Hawking’s event horizon converge. What I like about Nolan’s films is that, like master filmmaker Woody Allen, he doesn’t take us for idiots, and no one in his movie is an idiot either. All the principals are scientists! Let me say that again: all the principals are scientists. And they’re not B-characters, played off as dweeby comic relief (although McConaughey always has a notebook and a pen protruding from his breast pocket, because, uh, that’s how dweeby scientists dress, right? ), rather they are the drivers of civilization’s forward momentum. There are no military drogues to argue with over examine-or-kill, no politicians to red-tape progress, no civilians giving the army orders to shoot at Godzilla, no Annoying Kids. These scientists are fully formed, empathetic characters. INTERSTELLAR comes at the same time Stephen Hawking is being honored with the biopic, THE THEORY OF EVERYTHING. (Think about it: even Tony Stark is an engineer, Bruce Banner is a geneticist, Barry Allen is a forensic expert…) Synergy for a new movie trope: scientist as hero. Cooper’s daughter understands Morse code and physics, without having to explain why; one whole wall of her bedroom is stacked with books. I love it! 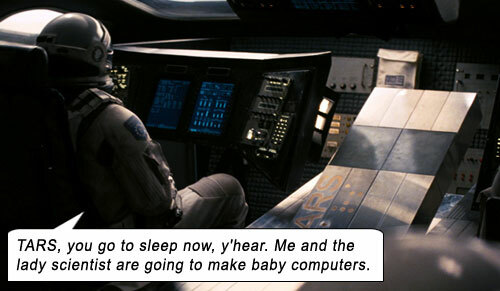 No astronaut gives dopey exposition dialogue to other astronauts that should already know that information. Matter of fact, the first act is a little off-putting, as we are not accustomed to such smart characters in a tentpole movie. Everyone speaks “universally” – of Mankind as a species, of the world’s fate, of generation-spanning solutions for humanity. People just don’t talk that way. (Let’s hope they start.) We humans are not wired to think past our own eyeblink lifetimes; the frailty of our minds reflects our bodies trapped in finite mass and function. As one character observes, “Evolution has yet to transcend that simple barrier” meaning thinking beyond your individual comfort, to the longterm welfare of the species. Nolan presumes our general knowledge of spacefaring dialect in 2014, and doesn’t insult us with baby explanations of time dilation (a black hole’s mass creating extreme gravitation which affects even time itself, slowing it down), or terraforming. [See POFFY SEZ: Leggo my Eggo.] And there is minimal didactic talk about wormholes and event horizons. That doesn’t mean INTERSTELLAR is carved from ignorant fluff: CalTech physicist Kip Thorne (friend to Sagan and Hawking) is employed as consultant and exec producer to keep the physics honest. And lo, INTERSTELLAR produces the most authentic black hole ever committed to screen, a startling void surrounded by a luminous accretion disk. It’s ALL theoretical speculation, even with the mathematics to support it, so the striking visuals for this and the spherical wormhole refracting star fields are anyone’s guess, yet Nolan and his effects team render visually what is hardly comprehensible even intellectually. 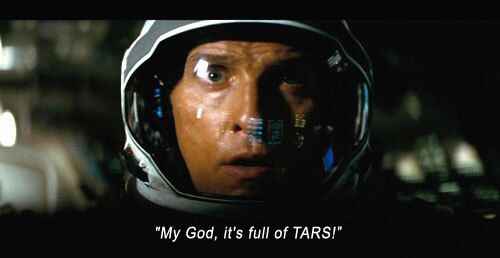 Cooper’s team have another member, a homage to 2001 in myriad ways – an artificial intelligence computer named TARS (voiced by Bill Irwin), an oblong monolith that speaks like HAL and walks like Gumby. Programmable for variable levels of Honesty (90%), Humor (75%), Sarcasm, etc., he can also assume various shapes to fulfill deus ex machina plot points. Even his demise is played like HAL’s sacrifice in 2010: ODYSSEY TWO (presumably with his Equanimity setting on 100%, as he goes without any complaints or metaphysical rap like “Will I dream?”). We imbue him with the same inexplicable screen-love we grant all anthropomorphized inanimate objects. He is Wilson, he is Hobbes, he is Number 5, and yes, he is even HAL. 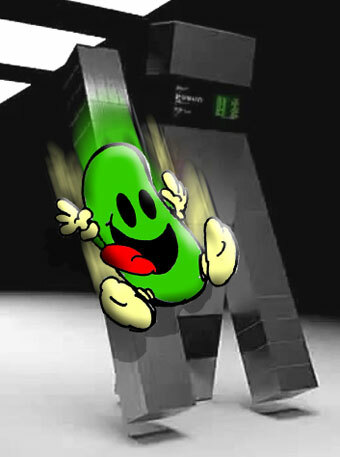 And Gumby. 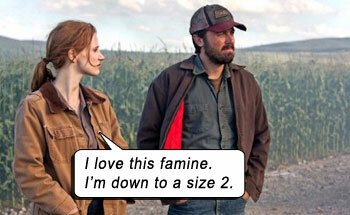 Cooper’s kids as adults are Casey Affleck (with a DUCK DYNASTY beard) and Jessica Chastain (ZERO DARK THIRTY) with enough angular thinness to slice bread. I know the future is short on food, but eat something, honey! She returns to her bookcases to crack the code for the film’s magnificent time-loop/poltergeist payoffs. With the aid of Topher Grace (desperately miscast as a fellow scientist), she tries to convince her brother to abandon the dying family farm. And to get her a sandwich. Nolan makes two excellent counter-intuitive casting choices, specifically to throw the audience. Michael Caine is one of those choices (as old Dr. Brand), who cajoles Cooper and his team into the wild black yonder. We’ve grown accustomed to Caine playing the lovable lump comic relief, but watch carefully how he cloaks his agenda in the palliating Dylan Thomas verses, “Do not go gently into that good night…” The other surprise casting appearance is for the same purpose. Soundtrack by Hans Zimmer bashes us over the head, then kicks us in the liver when we’re down. Glittering organ crescendo. Cut. Hall reverb out. Writers: Christopher Nolan, Jonathan Nolan. Starring: Matthew McConaughey, Mackenzie Foy, John Lithgow, Timothée Chalamet, David Oyelowo, Collette Wolfe, Bill Irwin, Anne Hathaway, Wes Bentley, William Devane, Michael Caine, David Gyasi, Ellen Burstyn, Josh Stewart, Casey Affleck, Jessica Chastain, Liam Dickinson, Topher Grace, Matt Damon. Time wrinkles back on itself. I still remember the explanation of tesseracts (commonly known as wormholes) from Madeline L’Engle’s 1962 children’s science fiction tale, A Wrinkle In Time. Endurance carries cryogenically frozen human eggs to repopulate a new planet. Humans take it for granted they have an inalienable right to terraform other planets without any thought whatsoever to the indigenous species already existent on those worlds; take it for granted they can casually overrun any ecosystem with their bacteria and sperm and snot. An arrogance exhibited offhandedly in all media, not starting with Carl Sagan, but definitely popularized by him in all his literature passim: terraform, get off-planet before it’s too late; an arrogance not even questioned in movies like STAR TREK II, RED PLANET, PANDORUM, PROMETHEUS, et al. But suddenly questioned when Nolan himself re-wrote Kal-El’s “purpose” in MAN OF STEEL as terraforming Earth, or when the aliens bothered Will Smith in INDEPENDENCE DAY — [needle scratch] — doesn’t seem so inalienable when extra-terrestrials do it to Earth, does it?! When humans terraform, they don’t even have to qualify why they do it – for “survival.” But survival of whom? Us? Them? Or a harmony between all species who must share the environment? Well, we know that last one’s utter Boolshit Maximus, considering the human species’ track record since the Space Age started. When it comes down to the wire, the comfort of every other species in the universe runs a distant second to us space-tards.